Although I only kept two items from my previous StitchFix (read about it here), I’ve been anxiously awaiting the arrival of box number four. Once again I requested Becca, but this time asked her for some edgier pieces to carry me through the holidays and into winter. Let’s check out what came in this month’s box, shall we? First up was the Pixley Robyn Teardrop Branch Necklace ($34). I like the design and the shape, but the color wasn’t as bold or exciting as I had hoped. Sometimes it’s had to tell, though, until you get it on and see how it works with an outfit, so I put it in the ‘maybe’ pile. Next was the Andrew Marc Bryn Sheer Top Textured Dress ($148). I love a LBD (little black dress) for the holidays, and totally agree with Becca that this one’s “the definition of elegance” with a sheer paneled top and shimmery bottom. The shape is super flattering, although the waist will need to be tailored a bit (I was pinning it back with my hand in the shot above), plus it’s versatile enough to be worn a few different ways. Third was a pair of Just Black Jake Slim Bootcut Jeans ($88). 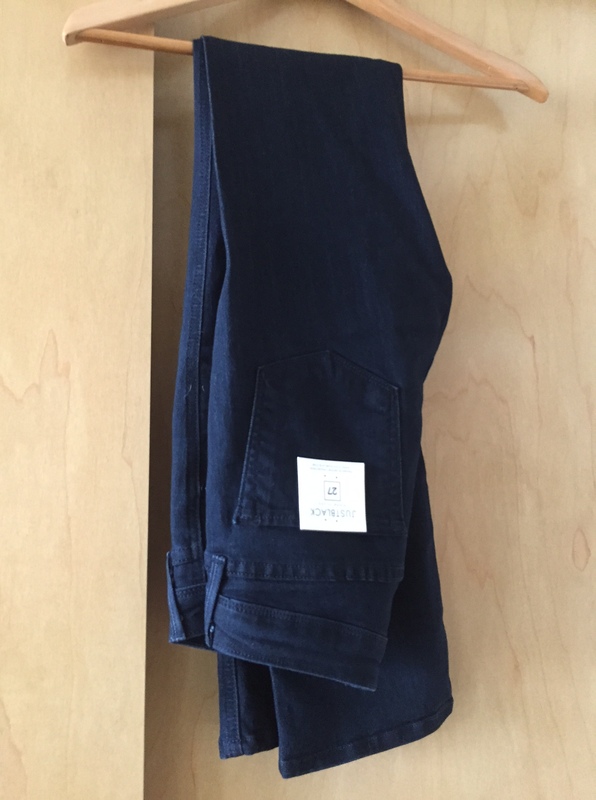 Becca was pretty accurate with sizing, and dark denim transitions well from day to night, making this a nice double-duty item. However, I’m starting to accumulate quite a bit of denim, so this was another one to mull over in the ‘maybe’ pile. 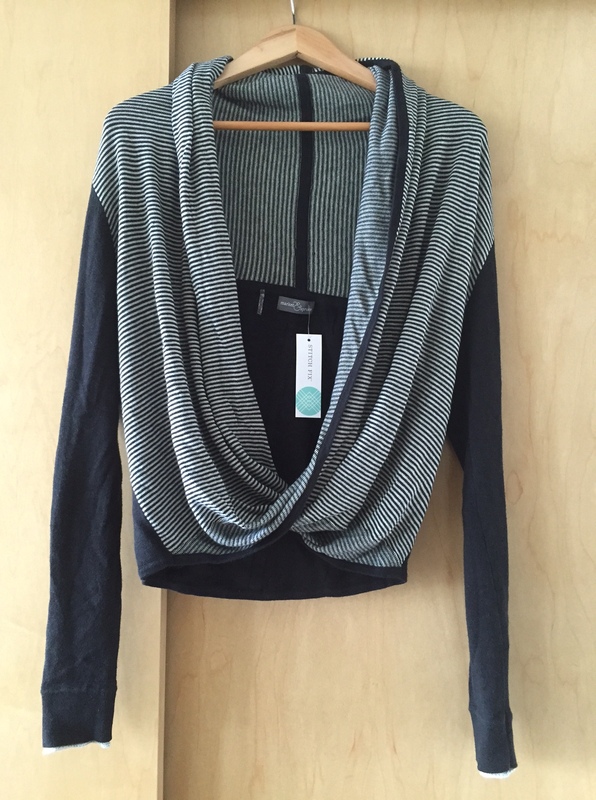 After that came the Market and Spruce Janet Striped Cross Front Sweater ($74). I wrestled — literally — with this one, putting it on upside-down at first (oops!). But once I untangled everything and got it on properly, it was not only cozy, but also a lot different from anything else I’ve got in my closet. Becca suggested pairing it with some heeled ankle boots and a bright scarf for a casual look, which I thought would be fun for winter. 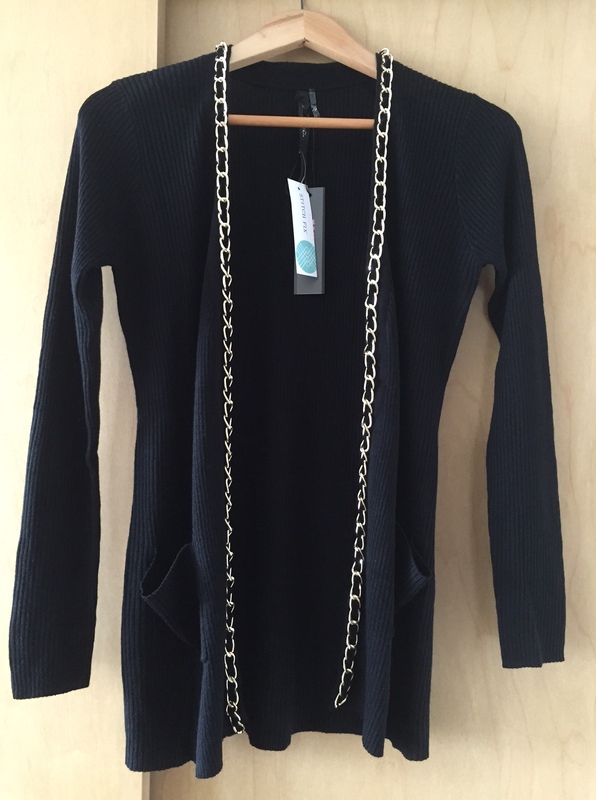 And, finally, was the Renee C Rocca Chain Trim Open Cardigan ($68). It’s cute, in theory, and I like how the chain-link trim could add some edginess to my wardrobe, but as soon as I felt the fabric I knew it was headed to the ‘no’ pile. Instead of a nice, rich wool, it’s a stiffer, scratchier polyester-type material, which is probably meant to withstand the weight of the metal. But, sadly, it just wasn’t doing it for me. So what did I end up buying? Because I was waffling on pretty much everything, the true test was running it by Hubby for a guy’s opinion. Of course, he agreed with my initial reaction to the chain-link sweater and that I didn’t need (another) pair of jeans. The necklace wasn’t met with much enthusiasm, either. And his word to describe the cross-front sweater? “Frumpy.” So out that went, as well! In the end, the dress was the only clear winner. 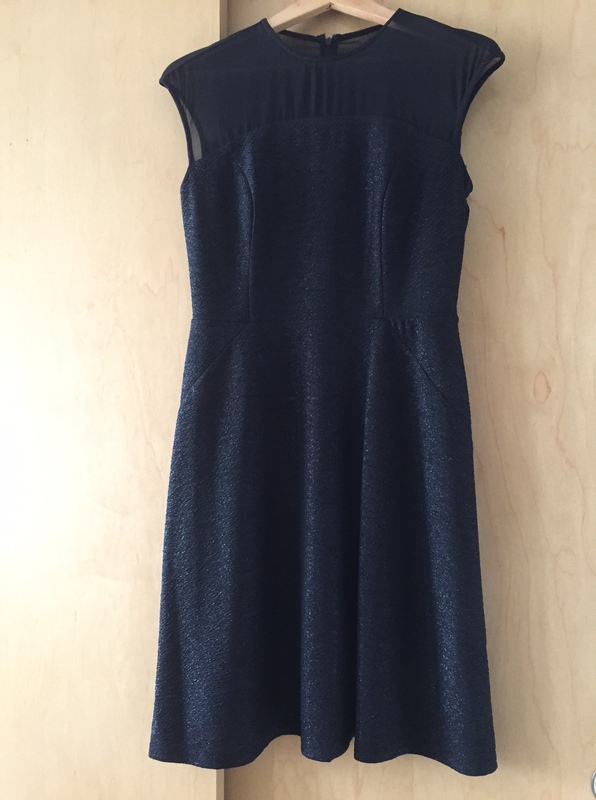 With a little nip and tuck from the tailor, it’ll be a great LBD for this year’s holiday parties, and since it’s a classic silhouette, I’ll likely keep it for years to come. My next fix is scheduled for the end of January, and I requested some dressy casual blouses and tops for work. I also asked that we brighten up the color palette to try to combat the inevitable winter doldrums and start looking forward to some bolder items that can be worn for spring. Disclosure: This is not a sponsored post. I simply love the service and think it’s fun to share my experience. I pay for Stitch Fix on my own. 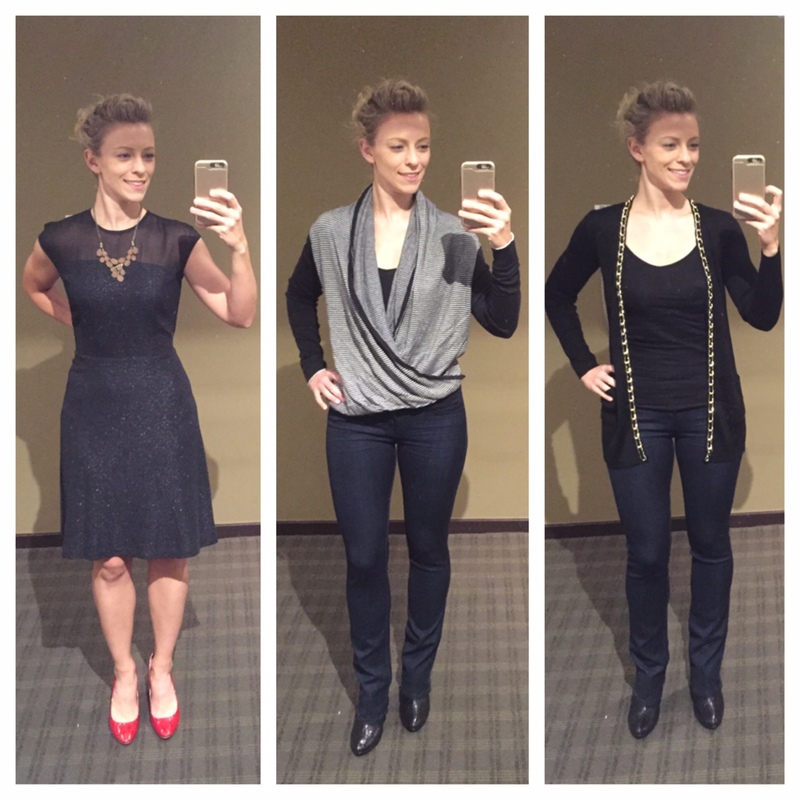 If you sign up for Stitch Fix using my referral link, I will get a credit…thanks!